Set in the historic Samuel F. Carter skyscraper, the JW Marriott Houston Downtown eloquently carries the rich legacy of the city forward, blending past and present in a dynamic fusion. Our luxury hotel showcases paintings and sculptures created by local artists for a dose of Southern hospitality. A Houston-themed restaurant, Main Kitchen, paired with our premier Spa by JW and 16,000 square feet of Houston event space make our accommodations ideal for business and leisure travelers alike. Convenient to the George R. Brown Convention Center, Minute Maid Park and the Texas Medical Center, the hotel is linked to the area's popular attractions and dowtown areas via public transit. Technologically advanced guest rooms boast iPads to order room service or summon the valet, 55-inch flat-screen HDTVs with 120 channels and complimentary wireless Internet access. Professional staff members offer personalized service and in-depth local knowledge. 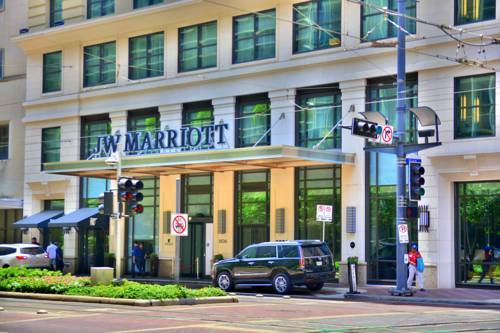 The JW Marriott Houston Downtown takes luxury to a whole new level. guest room stylish rooms with hardwood floors.